Score another one for live, premium Web content. The Atlantic Coast Conference’s digital network just launched a new channel with YouTube. The deal marks the first and only official partnership between YouTube and a major collegiate sports conference, according to Frank Golding, director of North American Sports at Google’s video unit. Launched in 2011 by Silver Chalice and the ACC, the ACC Digital Network produces daily conference coverage, including highlights, news and analysis, along with behind-the-scenes footage, interviews, historical content and coverage of all championship events. 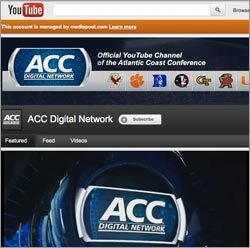 For the ACC, a partnership with YouTube means a partnership with Google. “As part of our partnership, we will be offering a series of Google Hangouts following select ACC game matchups for fans to directly interact with our analysts,” says Jason Coyle, COO of Silver Chalice. Per the new partnership, the ACC Digital Network has also agreed to deliver 20 live events in Olympic sports. New to the ACC Digital Network programming lineup will be a weekly live studio program on Saturdays throughout the football and basketball seasons. Through the live streaming, fans will have access to school-specific news up to game day. In addition, the channel will feature condensed replays of the ACC Network productions of football and men’s basketball games. The fall live game schedule is expected to be announced in the coming weeks.